I maintain that the Miss Universe pageant is not only about what’s the best answer by who, as it’s not the International Public Speaking Competition once won by our very own Patricia Evangelista; or which candidate had the prettiest face, as it’s not a Face of the Year search. Nor is it only about how each of the 89 candidates glided onstage because, definitely, it’s not the search for Ford Supermodel of the World. The competition is all about total package; the selection of winner is about who had the best stage presence that evening. A panel of judges had interviewed the delegates up close; they were then judged in their national costumes, swimsuits, and evening gowns at the preliminary. From then on, sixteen most exceptional ladies emerged as semifinalists. During the coronation night, they competed again in swimsuit, in evening gown, and at the question-and-answer round. Anyone who knows about pageants will agree that the one who stood out consistently from the rest should be crowned Miss Universe 2012. And if you televiewed the show, either the live coverage or the delayed telecast, you will most certainly maintain, too, that Miss Philippines Janine Tugonon brought the house down with her classic Filipina pulchritude, her fierce elegance, her graceful gestures and, of course, her momentous performance at the Q&A. When Venus Raj responded to her question at the pageant in 2010, these same people made a big fuss over her choice of words—major-major, that is—and blamed the answer for a fourth runner-up finish. Last year, third runner-up Shamcey Supsup’s honest-to-goodness answer drew negative remarks from the same bunch of bashers, who said that she should have given a politically correct response in front of the judges who, presumably, were not all Christians. As some people out there would say that Janine Tugonon paled in comparison with her fellow semifinalists who were prettier, I avow that her beauty takes a trained eye to be appreciated. And while I respect them for their limited exposure to beauty culture, lack of appreciation, or oblivion of their own blemishes, I wonder why on earth, up to this day and age, they refuse to understand what beauty means. Just because they say Janine’s nose is not perfect does not make her less beautiful than their ideal women. I dare them: “How would you want an Oriental lady to look alongside the different beauties from the different regions around the world? Could you imagine what a global beauty pageant looked like if all contestants had the same facial shape, bone structure, nose size, skin color, and so forth? Beauty is not monopolized by one race. It may sound corny, but there is beauty in diversity. As Edgar Allan Poe had said before he left this beautiful world: “There is no exquisite beauty . . . without some strangeness in the proportion.” Remember? 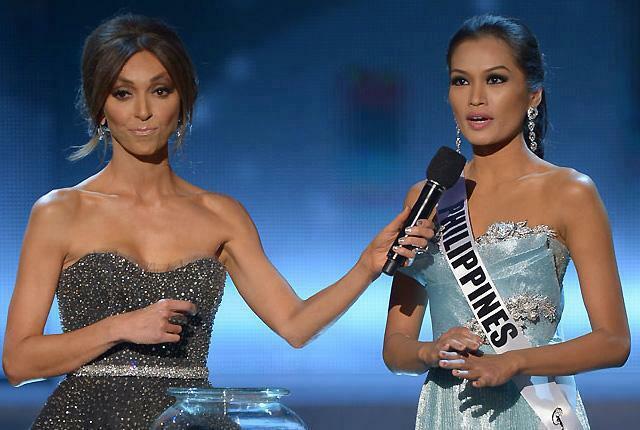 Interestingly, our very own Miss Philippines brought a best thought to the table and gave the best delivery—in English, that is, considering that Filipino is her first language, whereas the other finalists (especially Miss USA) whose first language is English, shared a so-so response to their questions respectively, observers said. But to despise Miss Venezuela for her answer—which, according to many, went astray from the question—seems bigoted, since English is not widely used in her country. In my pre-pageant blog, I predicted that the last two standing would be Philippines and Venezuela. So, even if Irene Esser’s answer was not the least bit impressive, she would still have deserved a notch higher, because she shone alongside Janine from the start, adding bells and whistles to the ocean of beauties onstage. Any keen observer will agree that Miss USA Oliva Culpo’s sole asset was her charm, period. Beyond that, it’s explicitly understandable why her victory did not educe incoming salvos from both the live spectators and the televiewers. Based on her performance that night, we could not help asking ourselves what she did from winning as Miss USA through packing up her bags in Rhode Island to competing in Las Vegas, Nevada—that is, to develop queenly grace, runway skills, and reasoning ability. Given that she’s three inches taller than five-feet-five and a lot more graceful and confident in her strides, still, she wouldn’t have been lauded happily for winning the Miss Universe 2012 crown—because, in the first place, as Miss USA whose first language is English, she should have nailed the Q&A with a fabulous answer.